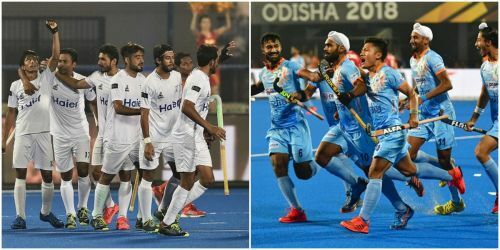 The 2018 Hockey World Cup has been going on in full swing at the Kalinga Stadium in Bhubaneswar from 28th November. In this edition of the tournament, there are 16 participating nations. They have been divided into 4 pools, with each consisting of 4 teams. At the moment, two rounds of group matches are already over. With the final round of group games coming up in this weekend, every hockey fan will be eager to know who stands where at present. Let us take a look at each group after the first two rounds of matches. In this segment, we look at the probable scenarios which can result in an India vs Paakistan clash in the tournament. If India finish 2nd in Pool C and Pakistan end at 3rd position in Pool D, then the two teams will face each other in the 2nd Crossover match on 11th of December 2018. If India finish 1st in Pool C and Pakistan finish 2nd, in Pool D, after beating the Netherlands in their last group match, then the two teams have a chance of meeting in the 4th Quarter Finals on 13th of December 2018, if Pakistan is able to beat the 2nd team of Pool team (which will probably be Belgium then) in their crossover match. Except from the above two scenarios, the chances of an India vs Pakistan clash, till the Quarter Finals is not possible. However the chances of these two great hockey nations meeting each other, at the later stages of the tournament, i.e the semifinals and the finals, is always there, if they are able to progress that far. The hockey lovers of the world will definitely love to see an India vs Pakistan clash in this World Cup, and if it is in the Finals, then there can be nothing better than that.